This is an article from the Swedish magazine "Hänt i Veckan" May the 23rd 1969. 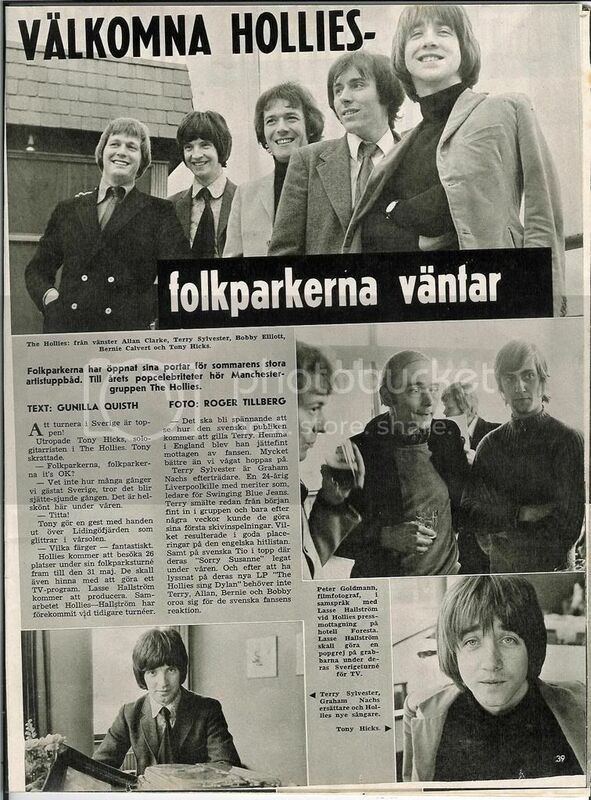 It includes a short interview with Tony from the Hollies' press conference in Stockholm before their tour of the folk parks. See my translation below. Touring in Sweden is great! Exclaimed Tony Hicks, solo guitarist of the Hollies. Tony laughed. -	Folkparkerna, folkparkerna, it’s OK? -	We don’t know how many times we’ve visited Sweden, I think it will be the sixth or seventh time. It’s so nice here in spring. Tony makes a gesture with his hand towards the Lidingö bay, glittering in the spring sun. -	Look at the colours – fantastic. The Hollies are visiting 26 places during their tour of the folk parks until May the 31st. They will also be doing a TV-programme. Lasse Hallström will be the producer. He has worked with the Hollies before on earlier tours. -	It will be exciting to see how the Swedish audience will like Terry. Home in England he got a really nice reception from the fans. Much better than we could have hoped for. Terry Sylvester is the successor of Graham Nash. A 24 year old Liverpool-guy with merits like, leader of the Swinging Blue Jeans. Terry blended in fine with the group right from the start and after just a few weeks they could make their first recordings. Which resulted in good placings on the British hitlist. And on the Swedish “Tio i topp” (Top ten) where their “Sorry Susanne” has been this spring. And after having listened to their new LP “The Hollies Sing Dylan” we don’t think that Terry, Allan, Bernie and Bobby need to worry about how the Swedish fans will react. Caption: Film photographer Peter Goldman talking to Lasse Hallström at the Hollies press conference at the Foresta hotel. Lasse Hallström is going to make a “pop thing” on the lads during their tour of Sweden, for television. Great article, and really fab photos! Thanks for posting this, Agneta! I see now that they've mixed up Allan with Bobby in the text under the large photo! Thanks, Agneta! Great article and lovely photos! I love the top photo! Check out Allan in profile drinking what looks like Coca-Cola in the second shot! I think that was beer, there was a head on it. I think the lads ,excepting Graham , were fond of their beer.CHEERS!!!!!!!!!!!! I'm not too fond of beer! But if I were drinking with Allan and the guys, I would be! I'd join you there ,mate . This must have been the tour they did with Bamboo as the support act, the band's first encounter with Mikael Rickfors. Great photo's Agneta,it made a really interesting read. I wouldn't have it any other way! I'll be waiting for you! And his eyes!! Oh!! Those eyes! !Beautiful Baby Blues!